On this fine Sunday evening I bring you my unboxing and thoughts on the 8th Annual Broke & Bookish Secret Santa. 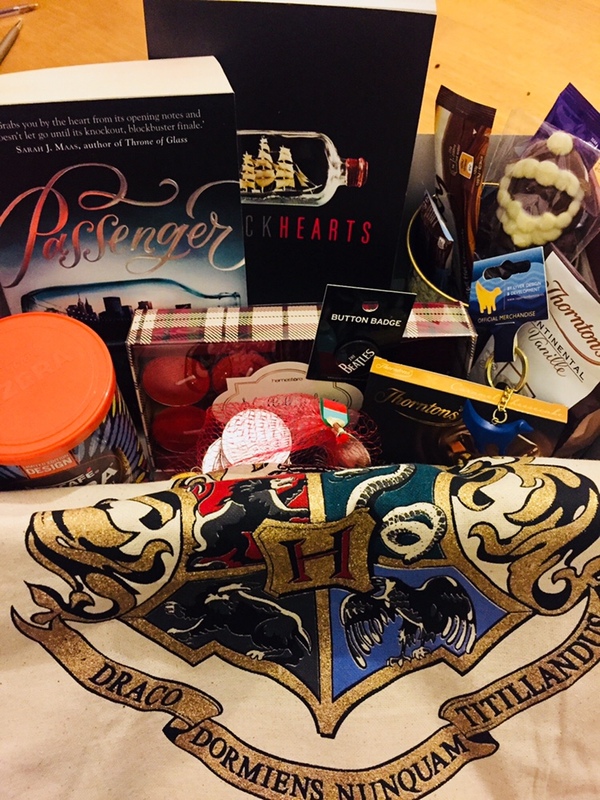 For those unaware, every year the lovely Jamie from The Broke and Bookish hosts a brilliant Secret Santa event for book bloggers everywhere. The aim of the game, obviously, is to act as someone’s Secret Santa and send them some presents based on the letter they send to their “Santa”. Earlier this year, I saw someone talking on Twitter about #TBTBSanta and after some investigation I traced it back to Jamie and her wonderful project and decided to join in! There are 3 levels/options and I plumped for the middle one because I’m perpetually on the fence like that. I filled in Jamie’s questionnaire (the letter to my Santa, if you will) and sent it off and then eagerly awaited the announcement of who I’d be buying a gift for so I could start shopping for my Secret Santa recipient! I love the idea of Secret Santas but my workplace wasn’t doing one so I’m really glad that the Internet gave me the opportunity to participate in one this year, hence my excitement. 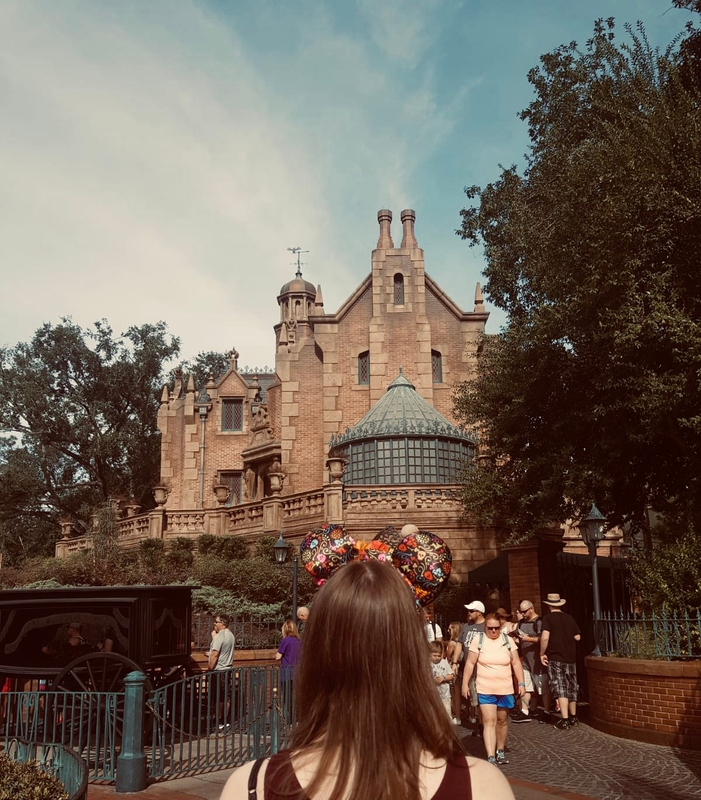 I adored having the chance to shop for a fellow book lover, to choose some books I thought she would like, and to include some little extra goodies too – I even slipped in a Superlambanana keyring for a little something from Liverpool. Not a lot of my friends and family love books to the same extent that I do, which means that I very rarely get the opportunity to gift books to other people for Christmas, so this entire Secret Santa gift giving experience was SO much fun and definitely something I’ll participate in next year. 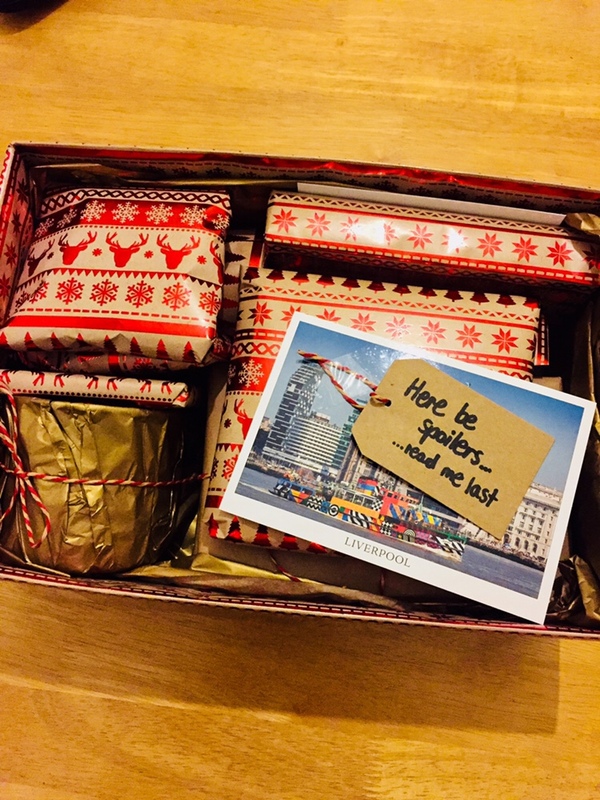 I’m SO relieved and absolutely thrilled that Amber enjoyed her box – that’s what Secret Santas and gift giving are really about, after all. Now to the box I received. My Santa was the lovely Jo/@iloveheartlandX who has outdone herself with my lovely gifts. I can’t thank her enough for being so thoughtful with the coffee mug (I do NEED coffee), Christmas-themed socks, Christmas chocolate balls, and more. I don’t know if she knew (or if she lives there?) but I love Edinburgh so the postcard of Arthur’s Seat was an extra unexpected surprise and the artwork on it is beautiful. She made sure to include a Christmas card too and I’m also SO looking forward to reading the book she chose from my wishlist: Kendare Blake’s One Dark Throne. 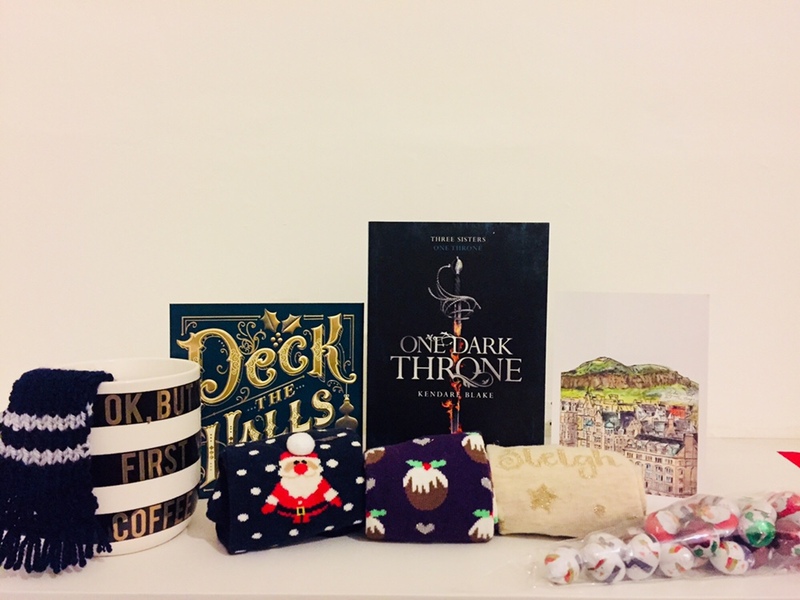 All in all, the Broke and the Bookish’s Secret Santa is an amazing project and I’m so happy I found out about it and participated this year because it’s really brightened up my month and got me in the mood for the festivities ahead at Christmastime. Did you participate in TBTB Santa or have you done so in the past? Or do you participate in any other Secret Santa gift exchanges, maybe with your friends or at work? Let me know below!